I am absolutely blown away by the incredible response to the Tricorder project! Simply speechless. On Tuesday night I uploaded the “About the Tricorder Project” video to Youtube before bed, and let my friends know that the Tricorder project website was ready to see on Facebook. Within hours it was on Metafilter, then Slashdot, Ars Technica, Gizmodo, BoingBoing, Tech Crunch, MSNBC.com, and Engadget, to name only a few. 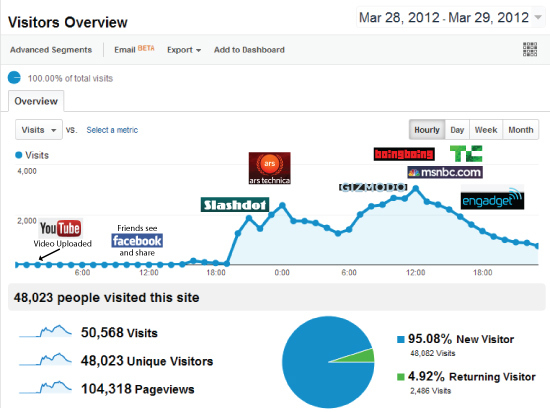 In the first day and a half there were nearly 50,000 visitors and 100,000 page views! That’s an incredible number! The Tricorder project and video have just recently made it to The Washington Post, Wired, and the International Business Times. The website has received nearly 70,000 visitors, 150,000 page views, and 80,000 Youtube views. Those are incredible numbers for the first few days! I am blown away, and feel humbled and privileged to have the project seen by so many wonderful folks. My inbox is bursting with your overwhealmingly positive responses, encouragement, interest in having tricorders, feature requests, donations, requests to speak — and I’m extremely happy to see so much interest in the project! I’m endeavoring to respond to all of your e-mails in the next few days, and clearly I’ll have to investigate crowdfunding options like Kickstarter (though Kickstarter isn’t currently available for Canadians, so I’ll likely have to use a similar service), and work to complete the Mark 4 development and figure out all the pragmatic issues involved in getting handheld multisensor devices in peoples hands. It’s really exciting, and I couldn’t be happier. For folks interested in keeping up-to-date with the Tricorder project, stay tuned to this blog for updates — I’ll endeavor to post at least a few times a week. You can also subscribe for updates over e-mail (using the widget on the top-right of the blog), the Tricorder project Facebook page, and the Twitter Feed. This entry was posted in communityresponse by peter. Bookmark the permalink. Somebody necessarily assist to make significantly articles I might state. That is the very first time I frequented your web page and to this point? I amazed with the research you made to create this actual put up incredible. Great task! You should totally check out Makible.com – Jon Buford & Nick Wang can also help you with the production itself, not only with the funding. They’re located in Hong Kong, so they have a good source for hardware. And congratulations! You totally deserve it! Your work is fabulous Dr. Jansen! I hope you do not mind that I occupied the facebook/opentricorder project today. Would you consider joining our team to make an open source entry to the Qualcomm Tricorder competition?